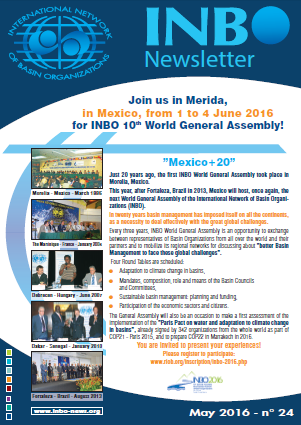 Register now to Europe-INBO 2019! 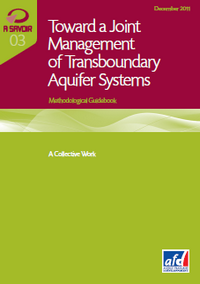 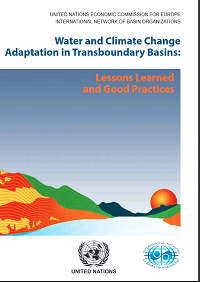 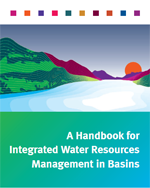 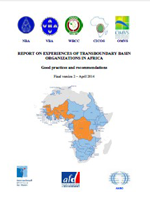 New guidebook on Financing Climate Change Adaptation in Transboundary Basins. 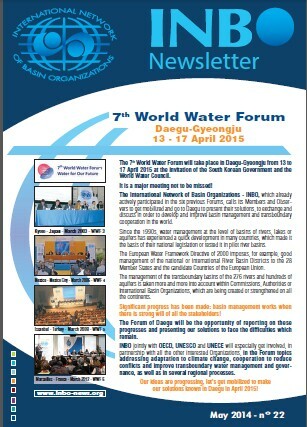 What knowledge is required for adaptation to climate change in the African water sector? 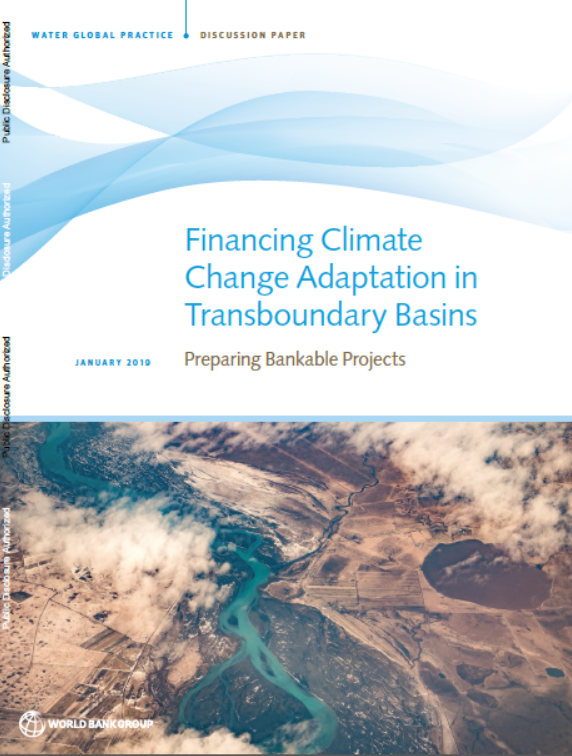 This publication is based on the preparatory work and conclusions of the training workshop entitled "How to prepare bankable projects to finance climate change adaptation in transboundary basins", which was held in Dakar (Senegal), 21 to 23 June 2017 as part of the activities of the Global Network of Basins Working for Climate Change Adaptation led by INBO and UNECE. 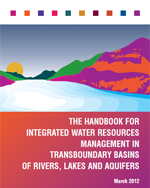 The guide provides practical answers to questions raised by donors and climate change adaptation project leaders, for example on the different stages of project proposal and associated procedures (different according to donors), on eligibility criteria and how to designate a recipient of funds (the transboundary basin organisation or one of its Member States), on the additionality of funding or on the sustainability of expected results beyond the project life cycle. 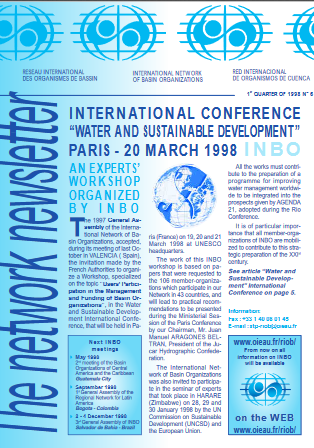 For 24 years, you have regularly received the “INBO Newsletter”, more than 30,000 copies of which are disseminated in French, English, Spanish and Russian all over the world. 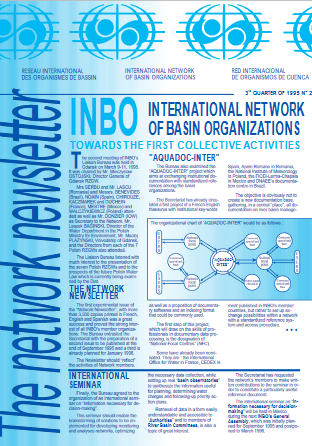 This newsletter is very successful and shows the mine of experience and information available in the 192 Member Organizations and observers of the International Network of Basin Organizations (INBO) from more than 88 countries and their mobilization to write interesting articles, which contribute to our joint project: “Integrated water resource management in river basins”. 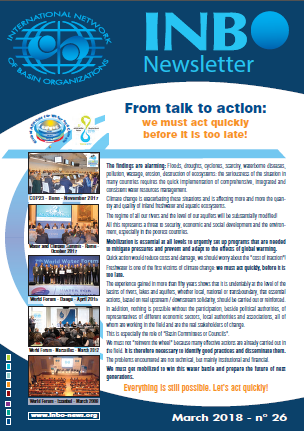 It is requested by many institutions, interested in following up our actions. 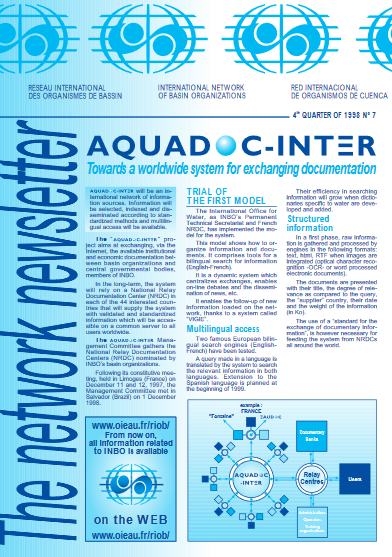 Acknowledging this fact, we are launching the 27th issue of the “Network Newsletter”, which will focus on the proposals and practical experiments of the members of our Network and of their partners, as well as on the large priority topic of adaptation to the effects of climate change following the COP21 in Paris, the COP22 in Marrakech, the COP23 in Bonn, the International Summit on “Water and Climate” in Rome and the last World Water Forum which took place in March 2018 in Brasilia. 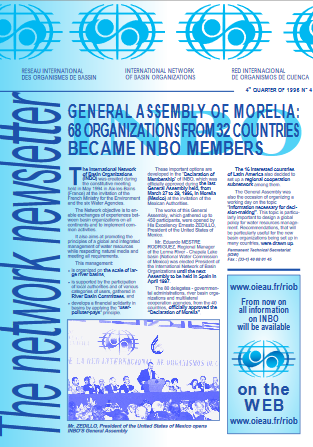 As for the previous one, this new “INBO Newsletter” will only come into being if all the Member Organizations and Observers directly contribute by writing the articles they wish to be published, and by complying with a few basic rules to facilitate its editing and translation. 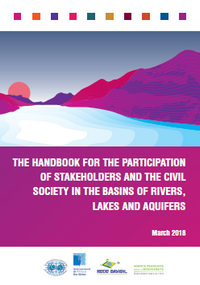 The letter is also open to any organization which implements or supports integrated river basin management and adaptation to climate change over the world. 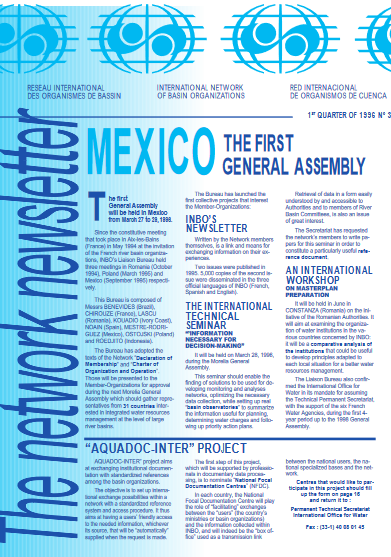 For this purpose, you will find in an appended note some recommendations to be taken into consideration when writing your articles. 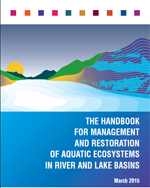 Please be reminded that each article must be short and not exceed 2,500 characters (spaces included) or a typed page – Arial 11 and 9 on Word. 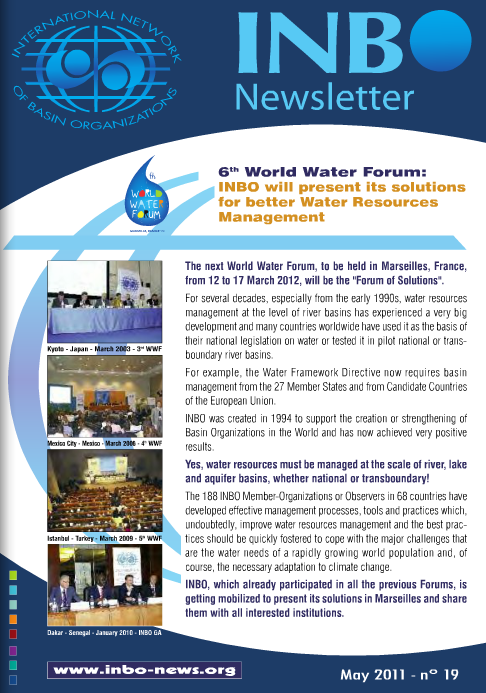 Kindly send your articles to the Permanent Technical Secretariat - IOWater in Paris - together with their translation (French, Spanish and English). 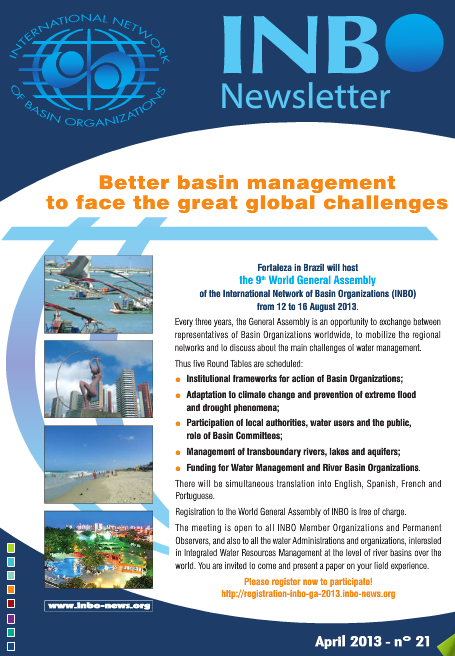 These should ONLY be sent by e-mail at the address: riob@riob.org. 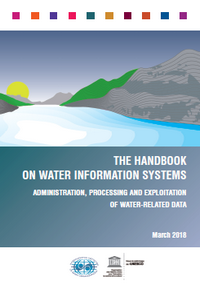 To illustrate your articles, colored contrasted photos, your logos, as well as maps or readable colored diagrams, would be welcomed, only in an electronic version (jpg format – high resolution – size bigger than 700 K). 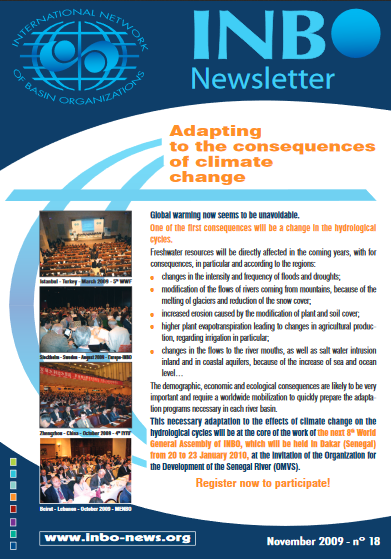 In order to publish the newsletter during the first quarter of 2019, the 15 OCTOBER 2018 had to be set as the deadline for receiving your articles at the Secretariat. 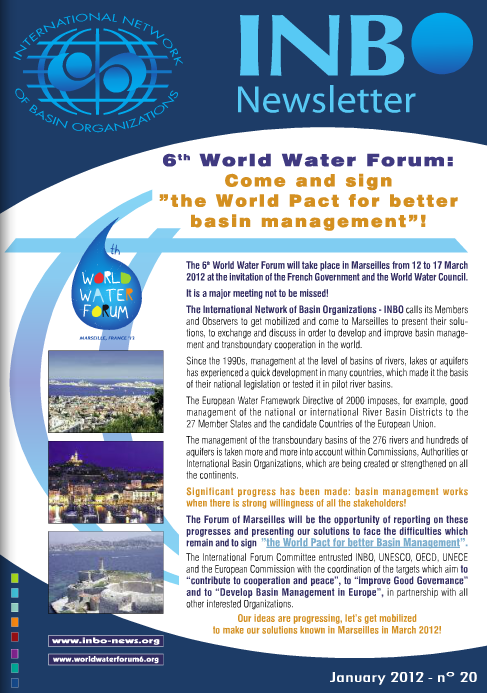 Please do your utmost to meet this deadline. 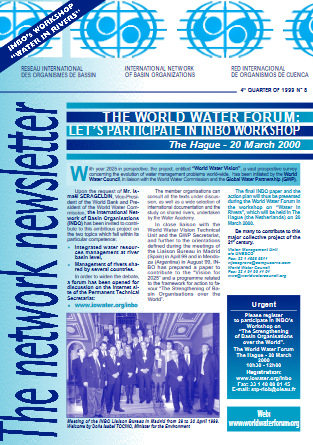 Publishing Manager of "INBO Newsletter"
The Handbook on Water Information Systems.